Spurgeon saw the value of preaching to the common people in their own language and in a way that captivated their interest. He well understood the sophistication of the Established Church and its irrelevance to his own social setting. One editorial cartoon depicted an Anglican rector driving an old stagecoach with two slow horses—named “Church ” and “State. ” Racing ahead, however, is a young preacher with flowing hair, speeding on a locomotive engine. The title of the second cleric’s locomotive? “The Spurgeon, ” of course. Even British evangelicalism tended to be an upper-middle-class institution. With his “vulgar ” style, however, Spurgeon spoke to the people of the street. Actually, Spurgeon’s church became known as a “church of shopkeepers, ” but the criticism still mounted. Spurgeon finally said in exasperation, “Scarcely a Baptist minister of standing will own me. ” But multitudes came to hear him preach. When it came to declaring the gospel in a relevant fashion to the common masses, Spurgeon was a master. He was a nineteenth-century reflection of George Whitefield. Spurgeon once described his approach to preaching by saying, “I take my text and make a bee-line to the cross. ” He burned with a desire to preach the Good News and see people won to faith in Jesus Christ. Spurgeon declared that “Saving faith is an immediate relation to Christ, accepting, receiving, resting upon Him alone, for justification, sanctification, and eternal life by virtue of the covenant of grace. ” He fervently urged people to enter into this faith relationship. What may seem paradoxical to some today is that theologically, Spurgeon tenaciously clung to traditional Calvinism. Evangelistic appeals came from this preacher who adhered to the traditional five doctrinal points of the Synod of Dort, including unconditional election. Spurgeon stood on the precarious razor’s edge between High Calvinism and Arminianism and preached the Word of God as he understood it. Thus, The World Newspaper reported that “Mr. Spurgeon is nominally a Calvinist. ” He was rejected by many of the high Calvinistic churches. 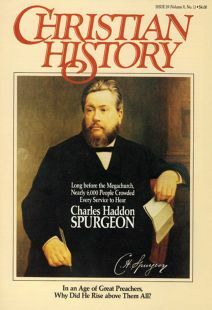 The pastor of the Surrey Chapel, for example, spent time every Sunday criticizing Spurgeon’s previous sermon because it was not Calvinistic enough. At the same time, Spurgeon was certainly not admitted to Arminian circles because he was far too Calvinistic for them. Why this paradox? Spurgeon preached what he found in the Word of God and was not overly concerned to systematize everything. A reading of just a scattering of his sermons makes it obvious that when Spurgeon took a text, he took it seriously. And he used it to point people to Christ—not to establish or reestablish a formal doctrinal system. Spurgeon was endowed with a beautiful speaking voice—it had melody, depth, and a resonance that could be heard by many thousands of people. Yet he never seemed to be straining. He also had a dramatic flair and style that was captivating. The manager of London’s Drury Lane Theater said, “I would give a large amount of money if I could get Spurgeon on the stage. ” Not that Spurgeon was superficially theatrical; it was his real self that gave him such a dramatic style in his preaching. Spurgeon also had an eloquence that gives the impression he labored hours over his similes, metaphors, and dramatic illustrations. Yet he prepared his Sunday morning sermon Saturday night, and his Sunday night sermon on Sunday afternoon. He would walk into the pulpit with a simple, small outline, sometimes written on the back of an envelope, and from that extemporaneously pour forth eloquence almost equal to Shakespeare’s. At the same time, it is only fair to say that Spurgeon studied diligently and read avidly. He amassed a personal library of over twelve thousand volumes, and he had a virtually photographic memory to call up his hours of study when he needed them in the pulpit. The question is raised, Was Spurgeon an innovator in his preaching? Spurgeon broke with tradition and convention; he would not preach stilted sermons. As pointed out he spoke in common language to common people—in a dramatic, eloquent, even humorous way. He painted word pictures. If there was “newness ” about Spurgeon’s method, it was that he strove to be a communicator. Spurgeon never forgot that if a preacher fails to communicate—regardless of ability, sincerity, theology or natural gifts—a preacher has failed. So he addressed people where they were and spoke simply to their deepest needs. That is innovation at its best and would make a preacher effective in any age. Foremost of all, Spurgeon was a man of God. The depth and breadth of his spirituality was profound. He quoted medieval mystics as well as John Law, John Wesley, and other spiritual giants of European Christianity. He was devoted to prayer. Devoted to the Scriptures, to disciplined prayer, and to godly living, Spurgeon exemplified Christian commitment when he stood in the pulpit. This itself gave power to his preaching. Perhaps it is correct to say that as a preacher, Spurgeon had everything—except good health. He suffered constantly from various ailments and fell into serious depression at times. He had rheumatic gout that eventually took his life at the age of 57. Yet Spurgeon overcame physical limitations and relentless criticism to be established as the greatest Victorian preacher. He went to New Park Street Baptist Church as a teenager and on his first Sunday preached to eighty people. Yet during his thirty-seven years of ministry there, the congregation grew to become the largest evangelical church in the world. When one considers Spurgeon’s great heart, biblical exposition of the gospel, cultural relevance, dramatic flair, and eloquence, it’s little wonder he took the country by storm.